Some of Billy Joel's former backing band chat about their time with the "Piano Man" in director Fran Strine's new documentary on famous side-players, called Hired Gun, which opens in 320 movie houses nationwide on Friday June 29th. Strine admitted to Newsdaythat she ultimately lost respect for Billy after finding out how shabbily the key players of his studio and touring band claimed they were treated upon being let go: "I was such a fan of his because he was such a great performer and songwriter. But when I heard of what he did to people he had worked with since they were teenagers, people who were left out in the cold, I just thought it was heartless." Drummer Liberty DeVitto and guitarist Russell Javors are in the film, with DeVitto talking on camera about his importance to Billy's legendary songs, explaining, "If Billy is the father, the parent of those songs, I’m at least the uncle." DeVitto says that switching the original reggae beat of "Only Good Die Young" to a shuffle as featured on the final version was his idea, telling Billy, "The closest you’ve been to Jamaica is Jamaica, Long Island, when you change trains on the Long Island Rail Road." Liberty DeVitto, Russell Javors, and Richie Cannata now perform in the Billy Joel cover band, the Lords Of 52nd Street -- which was the nickname given to them by Billy's producer, the late- Phil Ramone. Still, DeVitto says in the film that the years of bad blood and lawsuits can't diminish their musical connection: "If I saw Billy I’d go up to him and hug him and tell him I love him. If he called me up and said, 'I’m sorry. Do you want to play again?' I’d say 'yeah.'" Billy told us that the success of 1977's The Stranger could only have been realized by producer Phil Ramone who allowed him, drummer Liberty DeVitto, late-bassist Doug Stegmeyer, and saxophonist/keyboardist Richie Cannata to tackle the work at hand: "I was working with a group of musicians that nobody wanted to work with, they were just 'road guys.' So I said, 'No, I want my band.' Phil got it right off the bat. He said, 'I want these guys to play on your record.' He encouraged them and they blossomed, and the result was The Stranger album. So, he knew." ," "Scenes From An Italian Restaurant," "Only The Good Die Young," "My Life," "Big Shot," "Honesty," "Don't Ask Me Why," "You May Be Right," and "It's Still Rock n' Roll To Me." After Cannata's departure from the band, the pair went on to play on such favorites as "Allentown," "Goodnight Saigon," "Pressure," "The Longest Time," "Keepin' The Faith," "Uptown Girl," "Tell Her About It," "A Matter Of Trust," and many, many more. 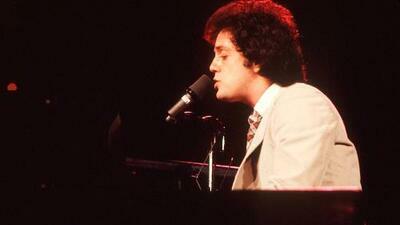 Billy Joel will next perform on July 5th at Madison Square Garden.